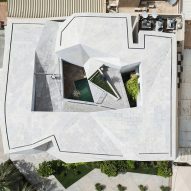 This private home in Kuwait, deigned by AGi Architects, features a faceted concrete shell clad in stone that folds up and around a central courtyard. 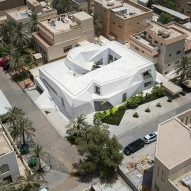 Its shell encloses a series of inwardly facing living spaces. 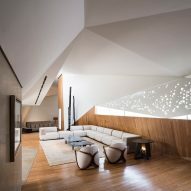 AGi Architects, which has offices in Madrid and Kuwait, designed the Rock House as a single-family home to be eye-catching but entirely private. 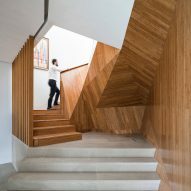 "The concept stems from a controversial duality imposed by the client's need for complete privacy as well as the desire for distinguishing the house as an iconic building within the neighbourhood," AGi Architects explained. 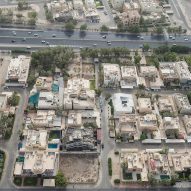 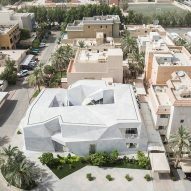 The building occupies a prominent corner site in the residential district of Abdulla Al Salem and its unusual sculptural form, reminiscent of origami, provides a distinctive landmark in the streetscape. 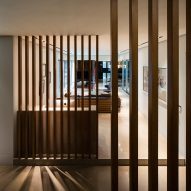 The client's need for privacy informed the house's predominantly solid outer form. 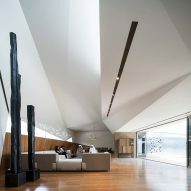 The few openings incorporated into the facades are angled to prevent views and direct sunlight reaching the interior. 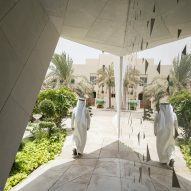 Reflective metal screens featuring irregularly arranged triangular perforations provide an additional layer of protection, as well as accentuating the angular forms of the various recessed openings. 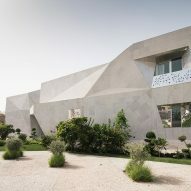 The house's structure is composed of reinforced concrete wrapped in stone panels that extend across the walls and roof. 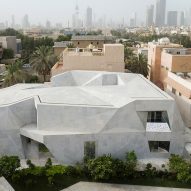 The use of a single material results in a robust and monolithic presence. 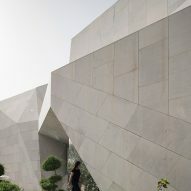 The building's outer shell is formed of faceted surfaces, described by the studio as "similar to folded origami". 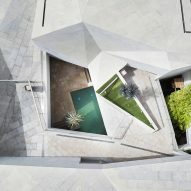 A courtyard at the centre is also enclosed by angular walls and ceilings that spiral upwards to connect with the upper floor. 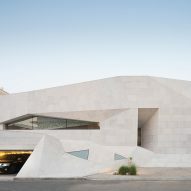 A main entrance is positioned at the street-facing corner. 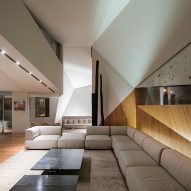 It opens into a living space that connects seamlessly with other rooms including the dining room and further lounge areas enclosing the central courtyard. 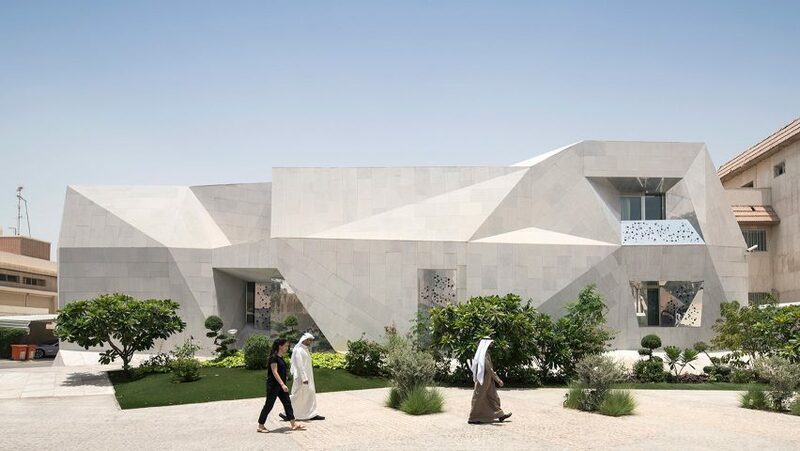 "Similar to traditional Muslim architecture, the use of corridors is avoided," the architects added. 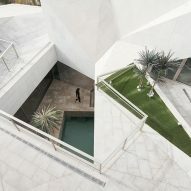 "Instead the house is seen as a whole entity comprised of changing conditions based on the various activities unravelling throughout the course of the day." 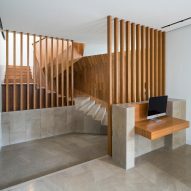 The architects suggested that, despite the proportions of the living spaces being "smaller than local standards", a floorplan that provides multiple circulation routes allows for functional flexibility and constant connection between them. 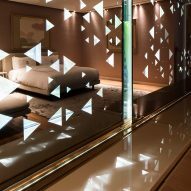 Sliding glass doors ensure plenty of daylight from the courtyard is able to enter the living areas. 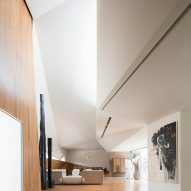 The doors can be opened to connect these rooms with the poolside terrace. 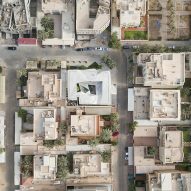 Other projects completed by AGi Architects' Kuwait office include a property featuring four hidden roof terraces, and a medical centre intended to look more like a cultural building than a health facility.